Last week, like many of you, I attended the 2013 Ignite OAAA/TAB Conference in Los Angeles. I probably saw some of you at the tradeshow, workshops, general sessions or receptions. The conference was very well attended, in fact one of the best attended in recent years, and there was a buzz of excitement and enthusiasm about the direction the OOH advertising industry is moving. The presenters and panels shared and discussed some great information, and whether you buy or sell digital, alternative, or traditional OOH media, there was relevant information for everyone. One main theme that seemed to keep appearing was Innovation. Three years ago, after the 2010 conference, I was writing about the idea of OOH companies working together to form a bigger national presence. The panels and presentations in the 2010 TAB/OAAA Conference were echoing how we should combine our efforts to create greater OOH coverage to make national buys easier. This year, the focus wasn’t on forming alliances with each other, but on collaborating with other types of media. We should be looking for ways to complement broadcast on the front end rather than presenting ourselves on the back end after most of the buy has been made. We should look for ways to initiate all-inclusive campaigns that can really make a difference for our clients. For instance, Bob Pittman, CEO of Clear Channel Media Holdings, gave an brilliant example of a big picture media campaign. They implemented a campaign for Target Stores to promote Justin Timberlake’s new CD. The promotion led up to a Timberlake CD release party. In fact, the digital billboards counted down the hours and minutes to the party. 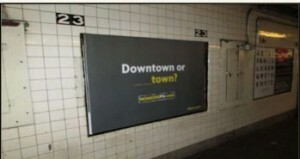 The multi-media campaign included OOH, Interactive media, social media, radio, Internet and TV. The campaign was so successful that Target sold out of the CDs and the social media results were even more impressive! Mr. Pittman gave several other examples of phenomenal results using OOH Apple, Samsung, and Beats by Dr Dre. Another great case study was presented by Amy Good, Manager, Media Centers of Excellence at Nestle, Purina PetCare Company (NPPC). Tidy Cat’s No more PU campaign included TV, Digital, Search, Print, OOH and PR. Even the outdoor portion was diverse – Digital and static billboards, shelters, and transit. The messaging was localized and engaging. The consumers were asked to fill in the blanks to complete the messages (only using the letter P and U of course). Other messages played off local references familiar to the residents in that city. Tidy Cat also used social media encouraging the consumers to tweet, which created a social media buzz based on the local market strategy. Tidy Cat got a great return on their OOH Investment. They saw a significant lift in brand awareness, social media buzz and website engagement in the OOH Markets. As these case studies prove, OOH has a significant impact on increasing website traffic and creating a social media impact. Diane Williams, Senior Media Research Analyst for Arbitron, Inc., released some great findings on OOH and Social Media Convergence. Her presentation was based on an Arbitron Out-of-Home Advertising Study and Project Rushmore 2013. Rushmorevote.com project found that OOH was credited for drawing 75% of the traffic to their website. For more information about these reports, contact Ryan Pogy at Arbitron (ryan.pogy@arbitron.com). Blue Bite presented information and case studies about using OOH in the mobile world. Mobile has grown into many innovative options that can easily be incorporated into OOH campaigns. Now you can include QR Codes, NFC technology, and Bluetooth capabilities. Technology and innovation have come so far from getting information to actually buying a product off of an ad. Our smart phones are getting smarter and smarter, but OOH is really the only interactive medium that can incorporate these choices effectively. To sum it up, new growth for OOH will come from being part of multi-platform campaigns. We need to embrace mobile and social media, and make the engagement more relevant and localized. Use DOmedia as a resource to find mobile and social partners in order to initiate mobile and social campaigns. Interact with your customers by in a fun engaging consumers with relevant messaging.